RFToy is an Arduino-compatible gadget for interfacing with radio frequency (RF) modules. It can be used as a standalone gadget, or in conjunction with OpenSprinkler (including DC / AC / Pi) to decode and simulate RF signals on RF remote power sockets. This allows OpenSprinkler to switch not only sprinkler valves, but other general devices such as lights, heaters, fans etc. This is version 3.0 with built-in WiFi support (using ESP8266). 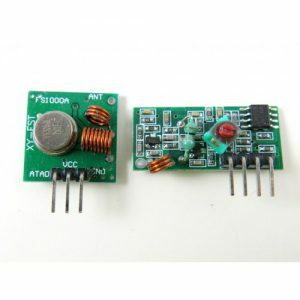 The kit includes one fully assembled RFToy, with a pair of 433Mhz transmitter-receiver and a pair of 315Mhz transmitter-receiver. RFToy is an Arduino-compatible gadget for interfacing with radio frequency (RF) modules. It can be used as a standalone gadget, or in conjunction with OpenSprinkler (including DC / AC / Pi) to decode and simulate RF signals on RF remote power sockets. This allows OpenSprinkler to switch not only sprinkler valves, but other general devices such as lights, heaters, fans etc. This is version 3.0 with built-in WiFi support (using ESP8266). 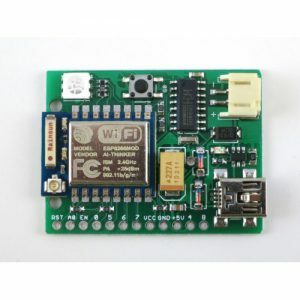 ESP8266 with web-based control and OTA firmware update. Pin headers to fit 433MHz/315MHz RF transmitter, receiver. Supports both WiFi mode and manual operation mode without WiFi. Support raw signal sampling mode that outputs raw RF signal capturing and display in web browser. Extra I2C and IO pins for connecting external components and breadboard experiments.